I knew I was going to like this from the first chapter. Kate is so effortlessly likeable and the premise is captivating and fun. The grieving for her mum was so well depicted -- I loved that it had realness and depth but it did not make the entire book get swallowed up by a grief-ridden, depressive tone. In fact, the book was loads of fun while also having so many shades of emotion (from all the different plot-lines). I was liking this a lot. And then: Enter that rebellious boy that the blurb mentions. Suddenly, I can't put the book down. Because HOT and SWOON and FUN with MYSTERIOUS MOTIVES. You guys, it had been a while since I had been so swallowed up by a book that I got that-up-all-night-loving-it buzz and this book was my saviour. 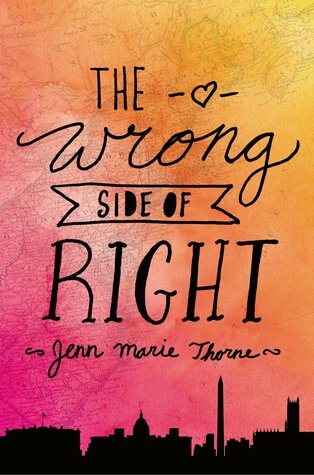 The Wrong Side of Right is smart and funny and clever and full of emotional depth. The plot never lulled, the characters were complex, and the swoon was real. I loved it, so. Also, there was an awesome message embedded (without ever being didactic) about being yourself. It's been 5 years since I started inkcrush. So much has changed in that time (online and in real life). So many great blogger and reader buddies have come (some have gone again) and I'm still making new friends (hi, everyone!). I really want to thank everyone who has been a part of inkcrush (so thank you!). You really don't know what it means to me to know that people drop by and comment, or have a read and ghost away again. I am continually surprised to see someone has linked to me, or someone knows about me (and this little squidgy corner of mine on the internet) or has found a new fave read from following me. There have been quiet patches on this blog and I've contemplated farewelling this space but it is a testament to my buddies and the lovely authors out there that I am still here (and I am very glad that I have not abandoned my little blog). In a challenge for myself, I've picked six books from each year of blogging that I have major love for to reminisce about the last five years of my reading life. Not necessarily my *absolute* fave books from that year but ones to highlight and recommend as books I have incredibly fond memories of reading (and I've tried to be a little diverse in terms of genres).